"Today's parade is sending the message that we are a peaceful people but we will never be oblivious of our defence," says Pakistan President Arif Alvi. 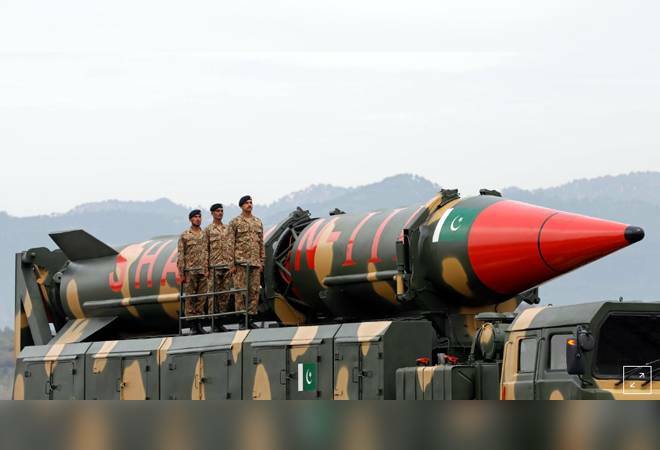 Pakistan wants peace with India and they should focus on health and education, the Pakistani president said on Saturday during a parade to show off its military might following a tense standoff between the nuclear-armed neighbours. Conflict between the rivals erupted last month following a suicide bomb attack claimed by a Pakistan-based militant group in the Indian party of the disputed and divided Kashmir region that killed 40 paramilitary police. "We do not believe in war and want to solve problems through dialogue," President Arif Alvi said in his Pakistani Republic Day speech. "Instead of war we should focus on education and health." Pakistani warplanes engaged in a dogfight with Indian aircraft over Kashmir on Feb. 27, a day after a raid by Indian jets on what it said was a militant camp in Pakistan. In their first such clash since their last war, in 1971, Pakistan downed an Indian plane and captured its pilot after he ejected over Pakistan-controlled Kashmir. The pilot was later released by Pakistan as a peace gesture. The president, who largely holds ceremonial duties, said India had blamed Pakistan for the suicide-bomb attack without evidence, which he said was irresponsible. Saturday's military parade included an air show featuring the Pakistani-built JF-17 fighter jet. One of the aircraft shot down the Indian plane last month. "Today's parade is sending the message that we are a peaceful people but we will never be oblivious of our defence," Alvi said. The parade was attended by Malaysian Prime Minister Mahathir Mohamad, who was invited to attend as the chief guest, and Pakistani Prime Minister Imran Khan. Khan said on Twitter earlier that he had received a message from Indian Prime Minister Narendra Modi with his best wishes for Republic Day and calling for peace and regional cooperation.